India claimed two gold, three silver and a bronze on Thursday, shoring up the overall medal count to 31. However, the country continued to be third on the table behind Australia and England respectively. 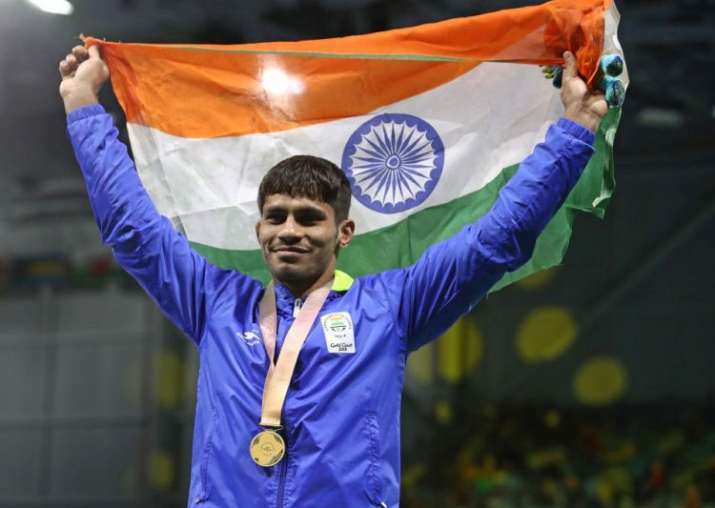 The wrestling gold rush began as expected and the shooting ranges also threw up medals before a couple of track-and-field podium finishes provided a near perfect end to what was a high-yielding day for India at the 21st Commonwealth Games in Gold Coast. Sushil Kumar pulled off an effortless performance for gold, a tad irritated Seema Punia opened India's track-and-field account with a silver, while former world champion Tejaswini Sawant's rifle shot down a silver too. In all, India claimed two gold, three silver and a bronze on Thursday, shoring up the overall medal count to 31. However, the country continued to be third on the table behind Australia and England respectively. India have 14 gold, seven silver and 10 bronze medals thus far. The day started with a silver at the Belmont Shooting Centre in Brisbane where Sawant added a second silver to her CWG collection of medals in the women's 50m rifle prone event. And then began the medal rush at the Carrara Sports and Leisure centre where the wrestlers snared four on Thursday two gold, a silver and a bronze. Defending champion Sushil (74kg) barely spent any time on the mat, his final against South African Johannes Botha lasted just a minute and 20 seconds as he picked up easy victories to claim his third successive gold at the Games, a love affair that began in 2010 Delhi edition. "When I am fit, I try to ensure that I win in this way (the way he won today). When I am not fit, I don't fight. I am fit right now," he said in a crisp analysis of his performance. Joining him in the gold-grabbers list was Rahul Aware (57klg), the man who finally found his moment of glory after 10 years of struggle. Ignored for big events, sometimes without a trial, Aware fought through a groin niggle in a pulsating final against Canada's Steven Takahashi. "I have been waiting for this medal for the last 10 years. I can't describe how it feels to claim it. I missed out on 2010, even in 2014, the team was sent without trials. So, I am very happy that I could finally fulfil this dream," said the 26-year-old, who is also the reigning Commonwealth championships gold-medallist. However, another defending champion Babita phogat (53kg) settled for a silver, while debutant Kiran happily flaunted a hard-earned bronze. Kiran defeated Mauritian Katouskia Pariadhaven by fall in the repechage of the 76kg category for her first major medal at the international level. "I think my weakness today was my attack, I should have been more aggressive but I gave my 100 per cent. I am satisfied with the intensity I put in but obviously I could not get the result I wanted," she said. In the evening, Seema Punia and Navjeet Kaur Dhillon notched up silver and bronze medals respectively in the women's discus throw event to end the day on a high for India. There were good results coming through on the badminton court as well with stars such as Saina Nehwal, PV Sindhu and K Srikanth remained on course for medals in the individual events after advancing to the quarterfinals with another set of comprehensive victories. The paddlers and squash players too continued to move ahead without any major hiccups and the weekend should add considerably to India's medal kitty. However, the day was not completely free of disappointment as the women's hockey team bowed out of final contention after losing 0-1 to hosts Australia in the semifinal. They will now be competing for the bronze medal against Olympic champions England. England were stunned in a penalty shootout by New Zealand.